Hi Will. Fab pics. It's definitely autumn. The trees look lovely, and there are lots of berries on the Rowans this year. The leaves are starting to fall. My favourite time of year. Love it!!!!! It's a good year for spiders too. We had a man eating one in the bathroom the other night. I caught it myself. I'm very brave. I super love all the colours, it will get better every week now until all the leaves drop. I will be taking photos from now on, not of spiders though! When you say man eating spider, do you mean one that could actually eat a limb in one go? Hubby always teases me, a giant beast was in the sink the other day. Hubby said 'don't look'! Well, that made me look, then scream...then he chased it around the bowl for a minute or two because it was fast. I kept saying make sure you get it!!! Oh what a performance. Rowans have been gorgeous this year, we picked some berries the other day to see if we can grow some more for our woody outlook. There's already a few there, full of berries. So we picked some white berries to see if we can get a different variety in there. Have you got any Rowans? Hi Will. The spider could have eaten two limbs in one go. I got up during the night and switched the bathroom light on and there it was. I don't know whether it's better to leave the light off then if there was a spider I wouldn't know about it. They had some severed limbs in Morrisons this morning for Halloween. They looked really gruesome. I think I'll buy one and put it in our dustbin then when him next door decides to sneak some of his rubbish into our bin he'll get the shock of his life. We have lots of Rowans. I hope your berries grow. My dad liked to grow things from berries. He once grew a decent sized tree from an apple pip. I went outside last night to get visiting cat's bowl. There was the biggest hedgehog I've ever seen sitting in it. Hi apples. I laughed about the fake limb in the bin for your neighbour, perhaps you should try this instead... http://www.youtube.com/watch?v=tRdxvYQLKzc It would be funnier if there were loads of fake limbs in a large wheelie bin though! Go on, it won't hurt him, he won't reach the top of a wheelie bin without a ladder...it'll all go over his head...I dare you. I would like to have seen the giant hedgehog in the bowl, how cute! We do have a young wood pigeon which sits in the bird bath and has a long soak..very funny to see. We have made some progress on our house, it is starting to look really good in one room at least. I'll have to try that Will. If if blew his head off it would roll down the street, and everyone would think it was a turnip. Although I think a turnip probably has more brains. We used to have a black bird who liked a good soak. He looked so funny. The leaves are falling fast now, and we have some huge toadstools. I love this time of year. It has such a lovely feeling somehow. I'm glad you're making progress on your house. You'll get there. The main thing is that you're both happy. appledore wrote: I'm glad you're making progress on your house. You'll get there. The main thing is that you're both happy. Teeheeee we are verrryyy happy and so are our Magpies, they haven't yet mastered the knife and fork, but insist on a plate now. They could take lessons from this turkey. Aren't these days lovely? I wish it was like this all the time. 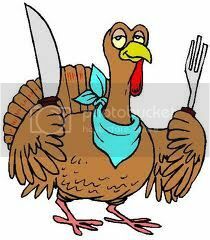 That clever Turkey will soon be on a plate! CHRISTMAS IS COMING!!!! Woop! These days are super lovely, so much fabulous stuff to see. I'll take some photos tomorrow on my walk of some fabulous toad stools on logs that I have seen. You are right in that it is a good year for toad stools, they are in abundance. Can't wait for crisp sunny days sweeping through leaves as I walk, you like cold sunny days too don't you? It is a lovely feeling when autumn comes, something very special about the whole season. I can hear jingle bells...hubby sais he has hidden the decs in case I get too excited and put a garland around our gorgeous new fire...tempted!!!!! Happy new fire. A pic to get you in the Christmas spirit. It's cold and windy today, but I love the dark, cosy nights when you can shut out the world. appledore wrote: Happy new fire. A pic to get you in the Christmas spirit. YEAH!!!!!!!!!!!!! 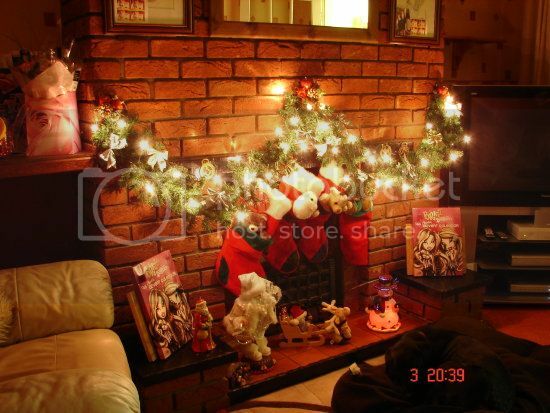 Oh that picture...neeeeed Christmas now! Me too, cold dark nights cuddled in front of the fire........... Isn't it wonderful! I was chatting with a friend today and she was laughing at how pleased I am with cold weather and the days getting shorter. I get the feeling most people like it warm and summer like. Me and you must be a little strange! Good though isn't it! I saw some Scarlett Oaks the other day, they are just starting to turn, it should look amazing soon. I am becoming a tree and bird spotter when I am out walking, hubby does tease me. He thinks I should have a utility belt with my bird and tree book, binoculars, pocket for berries and nuts and a small trowel. I did pull a tiny white poplar out of the ground yesterday, then I walked miles and miles with it. Picked up pocket loads of conker and acorns. I came home and spilled the spoils on the kitchen counter beaming with joy at what I brought home. Hubs was killing himself laughing...there was nowhere near enough roots for the poor little sapling. I potted it anyway and today it has wilted...oh! So a utility belt has been ordered, one with space for mini trowel. Have you finished gardening for this year? We are going to do our last lawn mow on the weekend. But we will have a lot of planting to do after that, and goodness knows when we will get around to it. You had me worried there Will, I thought you said chastity belt. I wondered what you'd been getting up to in the woods. I think I need my glasses changing. We've always known we're both strange. Or maybe it's everyone else. I love the cold weather, and can't see any pleasure in being hot and sticky. I'm glad you're enjoying your walks and bringing home all your treasures. You maybe should have been a squirrel. You could hide the acorns under the floorboards. We've just about finished gardening. We still have to prune the roses and cut down some plants. We're getting the hedges cut at the moment. It takes days, but they look really good when they've finished. I think we have one more grass cut. We have lots of large shrubs and the acers in pots on the patio, and when we move at some point we're wondering how we're going to get them to the new house. We'll need an extra van. Looks like the log has measles. I've never seen so many toadstools. Did your sapling survive? I read somewhere that you should put them in a plastic bag and then blow it up like a balloon. It helps to keep the moisture in and protects it. Or you could try talking to it nicely. You could say something like 'buck your ideas up or you're going in the dustbin'. That should do the trick. Our treemen have finished now, and the hedges look great. The sun shone for about five minutes today. I wish it would brighten up. Hi apples. Our little sapling went in the bin, I think the threat of this made it die of shock. I still haven't dug another one up, I will have to do this before the leaves drop, or I could bring home the wrong tree. How is your autumn colour? We have some, but most trees behind us our still quite green, with the exception of horse chestnut and silver birch. We are thinking about hanging a large piece of rotting wood to our tree, to entice wood peckers to our garden. Do you think this will work? We do have nut feeders, they sometimes go for them I think.